Scott and Julie argue about the meaning of "Only the mockingbird sings at the edge of the woods." Neighbors tell them to take it to the edge of the woods because it's 2:00 a.m. and "some of us have work in the morning!" They quiet down long enough to discuss Mockingbird by Walter Tevis. My apologies for the length of this email. It was too long for the comment box. I started to listen to your podcast on "Mockingbird" by William Tevis. I was intrigued and stopped the podcast immediately so I could read the book. I agree, it is a very good book, highly recommended. On the question about who the mockingbird is. I don't think you all went far enough. You can make some points about who is mimicking whom. The drugged humans are in a way trying to mimic the robots, who in a way are mimicking humans. Paul and Mary Lou like stories and the old silent movies, and so they are in a way trying to mimic how to be human from them. But I think the strongest case applies to Spofforth. 1. Did you notice the book starts on page one with the birth or activation of Spofforth and ends on the last page with his death? Does the title of the book point to this fact? 2. As you all mentioned in the podcast, a mockingbird mimics the songs of other birds. Spofforth often whistled a song that he did not know. He also knew how to play the piano but never encountered a piano to demonstrate his ability. Spofforth's mind was an "impression" made from a long dead human engineer. Despite their attempts to erase portions of the engineer's memories and personality, some things remained, like the song he whistled and his piano skills. His mind is an attempt to mimic a human mind. He even thinks that he fell in love with Mary Lou, any yet it did not satisfy him. His melancholy persisted. 4. I think part of his melancholy could be due to that he did not have any good role models of humanity to mimic. His mind's impressions of humanity from the dead engineer were missing portions of "humanness". (Like the genetic code for a mockingbird to mimic other birds.) The humans he dealt with were already conditioned to be withdrawn and to rely on drugs to numb and inhibit their humanity. Later, the contraceptives in the drugs further suppress human expression by sharing their humanity with new life. I think he found human contemptible, especially after he told Mary Lou that he wished she would abort the baby. You all really hit on a key point about creativity and its connection to being human. None of the humans in the story except for Paul, Mary Lou, and Annabelle created anything. Spofforth could repair things, but not create. Do mockingbirds create new songs, or do they strictly mimic? 5. 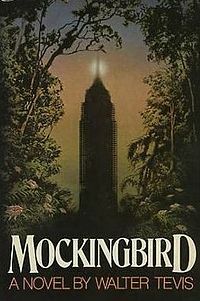 Scott brought up the question about the mockingbird being at the edge of the woods--was the mockingbird singing into the woods or away from the woods? Maybe the mockingbird is just being itself on the edge of the woods, singing his song in both directions? What if Spofforth, the mockingbird, is mimicking humanity at the "edge of the woods." The one human, Paul, that is stuck in the darkness in the middle of the woods is drawn toward the edge. After all, Paul does go to the university in New York from Ohio. And in the process of the novel, Paul passes from inside the woods to the outside. So, I think the mockingbird is Spofforth. Immolation -- why was this word used for suicide? Immolation means "to kill or offer as a sacrifice, especially by burning." It is a religious term! Who are they offering themselves to? A whole burnt offering for the sins of humanity? For redemption from a Babylonian-like exile from not living their gifted lives? The line "My life is light, waiting for the death wind, Like a feather on the back of my hand" is from a poem by T.S. Elliot called, "A Song for Simeon"--the same Simeon who was waiting at the temple for death but not before he saw the Anointed One. Maybe that was the real reason for Spofforth's melancholy--he knew or sensed that he could never have a true experience of transcendence. (Falling in love with Mary Lou did not supply it.) And yet Spofforth does in his last moment before his death; he experienced transcendence and joy in a sunrise too. He finally mimics the ultimate human experience, and is satisfied. Thank you for a great podcast and the tip onto a great book. Like you all said, things from the book keep popping up. Scott can't find a match for his Camels. Julie wants beer but all they've got is iced tea. Rose's little man is warning her about teaming up with these two — even if it is to talk about Double Indemnity. Roger Ebert's Guide to Film Noir - "A movie which at no time misleads you into thinking there is going to be a happy ending."